Often the most exciting aspect of beginning a new life abroad is buying the perfect home – what you choose and its location can be crucial to ensuring that your life abroad is a long-term success. There is a huge variety of property available on the Italian real estate market. Property for every budget and taste. Before taking the final decision, it is imperative to come and visit to come and visit the property first, and if you decide to go ahead and buy a property, it is equally important to speak to an independent legal adviser. 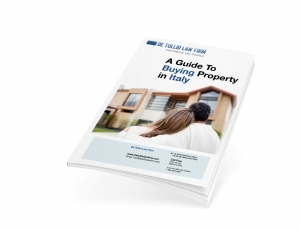 The procedures and terminology for buying property in Italy are quite different from what you are likely to be used to, so it is essential to have the assistance of an expert in the field through the process. 1. Proposta irrevocabile d’acquisto (Reservation offer): required especially when purchasing through an estate agent. Through this offer the property will be kept off the market for a short time, during which it is possible to carry out all the necessary research to verify that the property is not charged with any debts, mortgages, claims etc. At this stage it is necessary to pay a small deposit, which is normally retained by the estate agent or a solicitor until the offer is formally accepted by the vendor. Once the sale is finalized, this deposit will be considered as a partial payment of the purchase price, otherwise the deposit will be returned. The reservation offer is binding only for the buyer until it is formally accepted in writing. Once signed by both parties it then becomes a legally binding contract. 2. Contratto preliminare di vendita (Preliminary contract): formalizes the agreement between the buyer and vendor. This is an essential legal document because it fixes the detailed terms and conditions of the sale. One fundamental legal element of the preliminary contract is the payment of a deposit (caparra confirmatoria), normally equivalent to a minimum of 10% of the purchase price. In the preliminary contract the parties also set the date to finalize the transfer of ownership in front of a public notary. 3. Atto di vendita (Deed of sale): The final step of the agreement. The Deed is drafted by a public notary for completion in his office, and has to be fully compliant with the preliminary contract. Once the Deed has been signed, the balance of the purchase price is paid by the buyer and the keys are handed over. A copy of the Deed will be given to the new owner approximately one month after signing the same, that is to say the time necessary for it to be registered at the relevant Registry Office. According to the law, the Deed of sale must be drafted in both Italian and English should one of the parties not understand the Italian language. Proposta irrevocabile d’acquisto: This is where an initial formal offer is made and a small deposit is left. The price you are willing to offer has been determined and also any conditions you may wish to make. Contratto preliminare di vendita: This is the contract that sets out in detail the terms and conditions of the sale and also all the relevant cadastral and registry information. It is also known as a Compromesso. Atto di Vendita: The moment when in front of a public notary the Deed of sale is concluded, the outstanding amount of the purchase price will be paid and the keys to the property will be handed over to the new owners. Caparra confirmatoria: This is a deposit that is regulated under art.138 of the Italian Civil Code. If a deposit is defined as a “caparra confirmatoria” it confers legal rights and obligations” upon both parties. If you have decided to move to Italy, we advise you not to forget that, regardless of your country of origin, any property located in Italy will automatically be subject to Italian succession (inheritance) law. The law of legal succession (“successione legittima”) is applied when the deceased has not left any Will, therefore dying intestate. In such cases Italian law determines which relatives of the deceased have rights of succession (primarily the spouse, the legitimate and natural children and other descendants). But be aware that without a will, in the case of a lack of heirs within the classes of preferred relatives, according to Italian law, the hereditary Italian assets will go by default to the Italian State. For that reason it is highly prudent to have an Italian will drafted for you by an independent Italian legal advisor or lawyer in order to limit the possible undesirable or unintended consequences of the Italian “legal succession” laws.